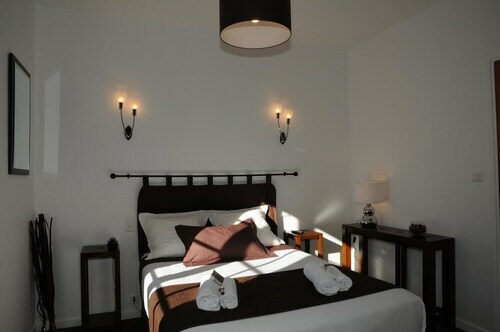 Situated in Sisteron, this hotel is 2.9 mi (4.6 km) from Sisteron Cathedral and 3.1 mi (5 km) from Sisteron Citadel. La Californie is 7.3 mi (11.7 km) away. Located in the heart of Sisteron, this hotel is within a 15-minute walk of Sisteron Cathedral and Sisteron Citadel. Gorges de la Méouge Biological Reserve is 12.8 mi (20.6 km) away. Sisteron Station is 11 minutes by foot. Situated in Sisteron, this spa hotel is within 1 mi (2 km) of Sisteron Cathedral and Sisteron Citadel. La Californie is 4.5 mi (7.3 km) away. Sisteron Station is 16 minutes by foot. Situated in Sisteron, this hotel is 2.9 mi (4.6 km) from Sisteron Cathedral and 3.1 mi (4.9 km) from Sisteron Citadel. La Californie and Gorges de la Méouge Biological Reserve are also within 12 mi (20 km). How Much is a Hotel Room in Sisteron? Hotels in Sisteron start at $48 per night. Prices and availability subject to change. Additional terms may apply. Are you arranging to spend some nights in Alpes-de-Haute-Provence? Need to reserve somewhere to stay in Sisteron? You'll find 4 hotels and apartments within easy driving distance of the center of Sisteron. Lodgings that you can discover within easy walking distance of the Sisteron city center, are the Hotel Les Chenes and ibis Sisteron. The Le Couvent des Minimes - Hotel & Spa is approximately 20 miles (32 kilometers) from the main part of Sisteron. Another hotel is the La Bonne Etape, which is situated 8 miles (13 kilometers) away. Some other places to stay include the La Campagne St Lazare and the Hôtel Fifi Moulin. While you are in Sisteron, be sure to explore more of what Provence - Alpes - Cote d'Azur has to offer. Provence - Alpes - Cote d'Azur proudly offers rural landscapes, beaches, mountains and gorges. The most popular traveler sights include ruins, traditional villages and old towns. Modern visitors in this corner of France can enjoy picnicking, sunbathing and city walking tours. Looking for activities? You could spend some time seeing Historic Moustiers Sainte Marie and Notre-Dame de Beauvoir, in Moustiers-Sainte-Marie, 30 miles (47 kilometers) southeast of Sisteron. Moustiers-Sainte-Marie hotels and apartments include the La Bastide de Moustiers and Hôtel Le Colombier. Alternatively, you could stay in Manosque, 25 miles (42 kilometers) south of Sisteron, where you can pick from the Le Pré Saint Michel and Best Western Hotel Le Sud. The Les Vannades and L'Occitane Factory are popular points of interest to experience should you visit Manosque. Located 55 miles (89 kilometers) away from the center of Sisteron is Caumont Airport. Find accommodation nearby at Auberge De Noves or La Livrée du Palais. Nice clean hotel with great location. Only drawback was the sewer smell from the bathroom which cleaning products did not disguise and which permeated the bedroom. Perhaps to be expected in a small, high up village?